I’ve really been embracing salad recently. Honestly, it wasn’t too long ago that I turned my nose up at leafy greens, but now I’ve started craving them. This salad is one of my favorites. It falls very low on the effort scale, but very high on the flavor scale. Here’s my smoked salmon salad! Easy! Wash your spring mix, halve the cherry tomatoes, chop up the hard boiled egg and throw it all together with your salmon on top! Sprinkle some oil, vinegar and pepper to taste, and voila! You’re done! 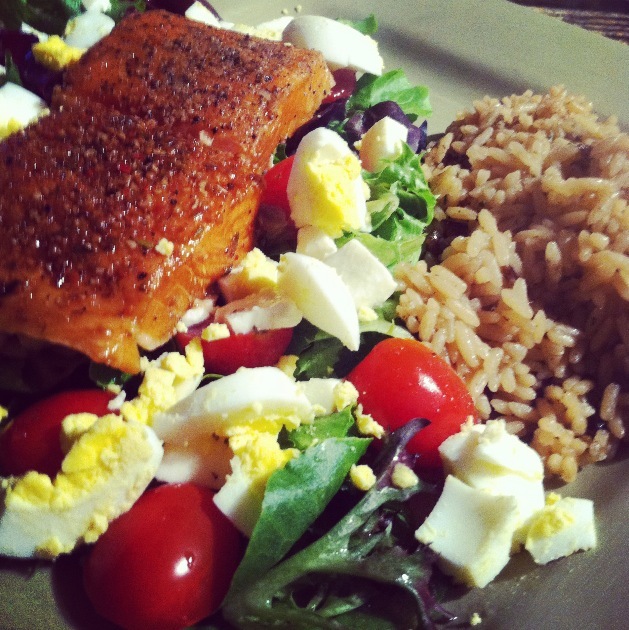 The salad ends up at just around 300 calories, so I usually serve this will some wild rice or quinoa. Hope you enjoy!